Regents Canal connects Little Venice with Limehouse Basin in the Docklands. This is a pleasant stroll through the heart of London, England. You leave behind the sounds of traffic and congestion and walk at your own pace along the tow path. This pictorial journey starts in the Docklands at Limehouse Basin and continues through Islington and Camden Town. 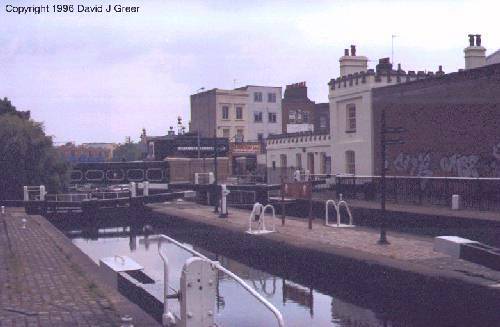 The picture shows some of the locks at Camden Town, about two-thirds of the way along this walk. Before the Industrial Revolution, goods were transported over long distances via tow paths next to Canals. Horses were used to pull narrowboats along waterways throughout the United Kindom. Waterways at different levels are connected with a series of locks placed in canals. If you want to learn more about canals, visit the London Canal Museum. Canals in the UK are developed and maintained by the British Waterways.